...I was going to blog every day while at SHOT Show. Even though I've been here before, I always over-estimate how much I can get done and under-estimate how exhausted I am when the show closes each day. Got to shoot my first gun with a "giggle switch" as Mrs Mom calls it. A Daniel Defense ISR in .300 blackout. Only shot a few rounds in full auto, but it was giggle worthy. Shot a KRISS sub-machine gun in .45 ACP on full auto. Cool, but not as cool as the DD. We made some connections for future blog interviews - an Olympic shooter and the World Fast Draw Champion. Mez is currently at the State of the Industry Dinner and will be writing up a post on that. This year, more than any other year is going to be very important, I think. I'm really interested to see what he's got to say when he gets back. 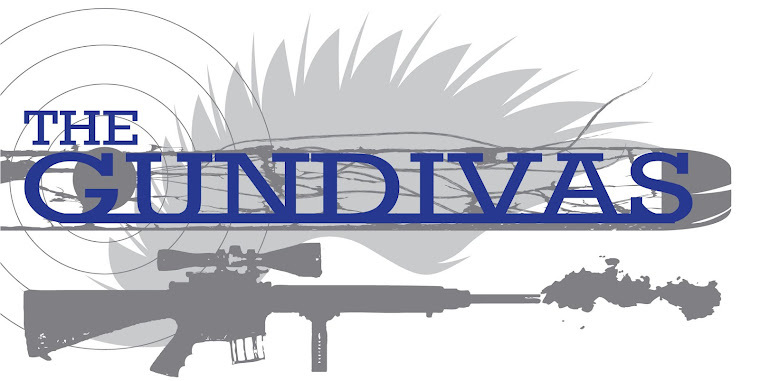 Next year, GunDiva. Next year. I am getting a hall pass from The Queen, I am cashing in some frequent flyer miles and hotel points, and I will be the one playing with giggle switches and meeting gunnie royalty. So glad you are having fun!! Glad to hear your gala of guns is going great! Love the updates! Rockem sockem! I want to hear more about you 'Giggle Switch.' I think my wife has one, too. We're Going to SHOT Show!